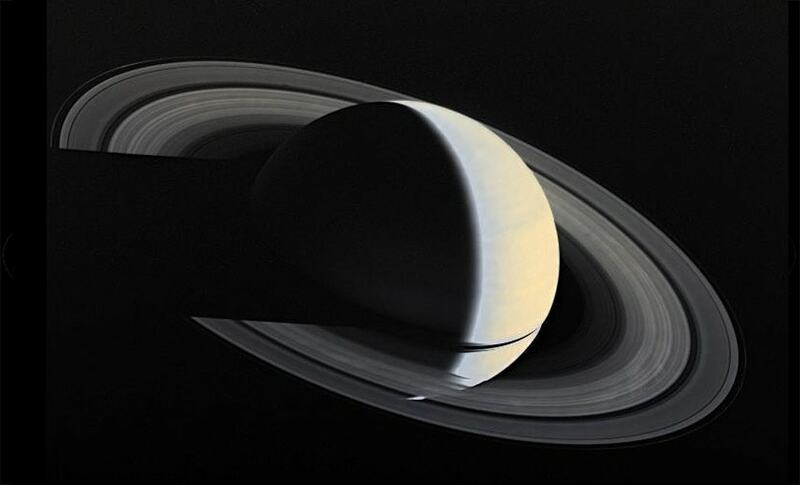 At its current rate, the Saturn's rings are likely to disappear in the next 100 million years. Saturn's iconic rings are being rapidly pulled apart into a dusty rain of ice particles under the influence of the planet's magnetic field, NASA scientists say. The final image of Saturn and its rings captured by the Voyager 1 Spacecraft. Image: NASA. At this rate, the Saturn's rings are likely to disappear in the next 100 million years. "We estimate that this 'ring rain' drains an amount of water products that could fill an Olympic-sized swimming pool from Saturn's rings in half an hour," said James O'Donoghue of NASA's Goddard Space Flight Center in the US. "From this alone, the entire ring system will be gone in 300 million years, but add to this the Cassini-spacecraft measured ring-material detected falling into Saturn's equator, and the rings have less than 100 million years to live," said O'Donoghue, lead author of the study published in the journal Icarus. "This is relatively short, compared to Saturn's age of over 4 billion years," he said. Scientists have long wondered if Saturn was formed with the rings or if the planet acquired them later in life. The new research favours the latter scenario, indicating that they are unlikely to be older than 100 million years, as it would take that long for the C-ring to become what it is today assuming it was once as dense as the B-ring. "We are lucky to be around to see Saturn's ring system, which appears to be in the middle of its lifetime. However, if rings are temporary, perhaps we just missed out on seeing giant ring systems of Jupiter, Uranus and Neptune, which have only thin ringlets today," O'Donoghue said. Various theories have been proposed for the ring's origin. If the planet got them later in life, the rings could have formed when small, icy moons in orbit around Saturn collided, perhaps because their orbits were perturbed by a gravitational tug from a passing asteroid or comet. Saturn's rings are mostly chunks of water ice ranging in size from microscopic dust grains to boulders several metres across. Ring particles are caught in a balancing act between the pull of Saturn's gravity, which wants to draw them back into the planet, and their orbital velocity, which wants to fling them outward into space. Researchers showed that glowing bands in Saturn's northern and southern hemispheres where the magnetic field lines that intersect the ring plane enter the planet. They analysed the light to determine the amount of rain from the ring and its effects on Saturn's ionosphere. They found that the amount of rain matches remarkably well with the astonishingly high values derived by scientists over three decades earlier, with one region in the south receiving most of it.